When starting out players can choose either a male or female character as their hero avatar as they are thrust into the storyline where an artifact has brought chaos on the world and many heroes and Angels have fallen under its influence further spreading the chaos it has wrought. As the hero of the story it is your responsibility to journey from place to place fighting these Legendary Heroes and powerful Angels to help them overcome this corruption. 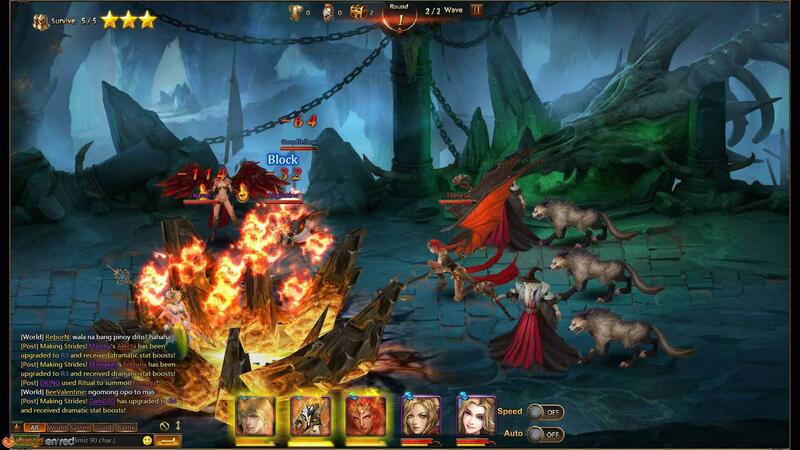 The game follows a traditional RPG team building system where players will meet and recruit a variety of Heroes and Angels to join them in their team, each has their own skills and abilities as well as a suited playstyle and role that they fill as part of a squad such as a front line tank defender or a backline healer. Players are able to improve their acquired companions in a variety of ways, typically by acquiring shards to then enhance their characters and make them more powerful, increase their stats, and acquire new skills. All skills, abilities and gear, as well as a number of other things, are all added together and given a value which determines the players personal Battle Rating score for their team; this number is an indicator as to how powerful the player and their group are in comparison primarily to other players when facing them in the Arena. Levelling up and improving all the components that improve your BR will ultimately make you stronger overall and able to take on greater threats and challenges. The core feature of the game is the story campaign where players will fight through a series of areas in the world and battle stage after stage, fighting against enemies and Bosses (including Deities that they may be able to recruit), earning a score and subsequent rewards based off of how well they perform in the fight (i.e. losing no heroes). Combat itself is a completely automated system where when you load into a battle both your own team and the enemy automatically start fighting each other, taking it in turns to make attacks and the game determines when to use your power skills once you have built up enough rage to trigger them when in full AFK mode, otherwise players must manually activate the power skills. Combat will continue until one side loses all their heroes. There are a variety of events and features available that players can engage in including Single Player content, Multiplayer content, Cross Server events and more. Single Player players can take on Hero Trials to earn a large amount of resources. The Abyss which allows players to try and advance through the Abyss to earn shards which help them upgrade their party members, or the Arena which allows players to compete against each other in PVP. The PVP is fully automated and focuses on players building a good team, even companionsâ€™ ultimate abilities are controlled by the computer and the loser is the first team to lose all their teammates. Prior to a battle players can choose which player they wish to challenge, able to see the opponents BR and rank they have a good indicator as to how powerful their team might be; for those able to climb the ladder and reach to top 20 ranks they receive the greatest rewards. Multiplayer content allows players to team up together and take on dungeons, Guild Dungeons, Guild Bosses and even World Bosses, which are powerful AI controlled creatures that anyone can fight and the players that deal the most damage earn the most rewards that can further help their team become stronger.